Even Fit Dogs sometimes have unexpected medical needs. And it can be particularly unnerving to have a medical issue crop up when you are traveling and away from your familiar veterinarian. That's exactly what happened to us during a recent trip to Chicago. One day Rocco was out playing and enjoying a walk in the park, and by that evening he was vomiting continuously and drooling profusely. Poor little Rocco looked awful. I had both a regular vet and an emergency vet for the Chicago area already in my contacts, and I was ready to pack him up and take him in if he got any worse. We made it through the night, and after consulting with his regular vet by phone, I decided to take Rocco in for a check-up in Chicago. While the vomiting had stopped, he still seemed nauseous and unusually wet in the mouth. Rocco likely ingested something (we never determined what it was) that caused the reaction, but the good news was he eliminated all the bad stuff and seemed a bit better in the morning. After some anti-nausea meds and hydration at the vet, he perked up and was good as new. We didn't have any other issues the rest of the trip. But that little scare made me wonder what else we should do to be prepared while away from home, especially since Rocco is an active dog and he, well, gets around! Soon after that incident, I had the chance to chat with Dr. Carlos Campos, who was just named America's Favorite Veterinarian by the American Veterinary Medical Foundation. Here's what he had to say about keeping your dog healthy while traveling. TDWL: What first aid items should you always have in your pet travel bag? These items are already included in first aid kit on the ASPCA online store. TDWL: Are there any meds you recommend traveling with, such as anti nausea or diarrhea medications? Dr. Campos: Meclizine is used to treat or prevent nausea, vomiting, and dizziness caused by motion sickness. Loperamide is a medication to treat acute, chronic, or travelers diarrhea. TDWL: What should you do if your pet gets sick while you traveling with them? 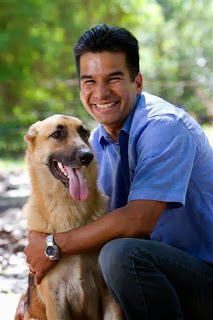 Dr. Campos: Call your veterinarian at home as they are familiar with your pet and likely will help you over the phone. In case of emergency go to http://www.myveterinarian.com/ to find a veterinarian near you. TDWL: With what types of symptoms can you "wait and see" how your pet does, and when is it best to visit a vet immediately? Dr. Campos: It depends of the type of sickness. If gastrointestinal, continued vomiting and/or diarrhea -- especially if blood is seen -- require an immediate visit. Any type of trauma would grant a visit if pain is sustained for an extended period of time. Any type of eye injury requires immediate attention. But it is best to reach out with specific symptoms to your veterinarian or a local hospital. TDWL: Is providing bottled water rather than tap water a good idea while traveling? Dr. Campos: If you are traveling outside the U.S., definitely. In the U.S. if the water is safe for you to drink then it is safe for them also. 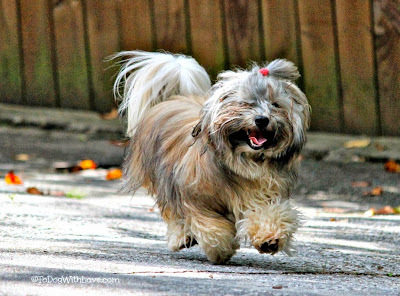 TDWL: Are there any other tips for keeping your pet healthy while traveling? Dr. Campos: Make sure that their microchip information is accurate and up to date. Keep a collar or harness on them at all times with your cell number on a dog tag. For more information they can visit the AVMA website. Some great tips... especially for active dogs like Rocco! Do you take any other safety precautions to keep your dog healthy while on the road? Let us know in the comments below. What a horrid fright. There is nothing worse. We are so pleased all was well. Have a fabulous Friday. Thanks pal! Happy Friday to you too! That would be quite scary. Both of my sisters like to eat stuff off the street, so they are likely to get sick, I don't do that, so I don't get sick much but it is good to know where the vets are and have a number or website to go to in an emergency! That's smart of you! Rocco likes to put everything in his mouth. I watch him like a hawk... but he's awfully quick! I agree on the word of mouth. In my case, I looked up a few vets who were close by and then asked some local folks for there suggestions too. Now, at least, we have some history with a great vet for any future emergencies. Seems like Jack and Rocco had the same problem this week (self-induced stomach issues). This is a really helpful list though and I hop pet parents make note. Poor Jack! Is he back to normal by now? Their issues sound exactly the same. We also were concerned about some sort of blockage, but x-rays revealed none, thankfully. The hydration seemed to work wonders, and since Rocco is so small, and young, we were concerned about that. After about 24 hours, Rocco was good as new! Great advice, Miss Diane and great interview with Dr. Campos. I am so sorry to hear my buddy Rocco got sick. I am glad he is back to 100%, that little rascal. Rascal is the right word! hehe! What a great article! It makes the humans stop and think. Great tip! Injury or sickness can happen anytime and anywhere, so its always better to be prepared! Good to hear Rocco that cutie is back to good health! Glad to hear Rocco is feeling better! I keep meaning to put together a dog-specific first aid kit but I haven't gotten around to it yet. We have a great first aid kit. I bought a good one and then customized it for us by removing or adding a few things. However, Chester's microchip info is not updated. It still has the info of his first owner from 7 years ago. It's been hard for me to change because they want her approval (to make sure I didn't steal him) but her and I are not in contact anymore. Not having the information updated eats at me though. Great information! I'm happy to see a good dog first aid kit available online. Thanks Rocco, Dr. Campos, and ASPCA. And thank goodness you're okay, Rocco.